Our old washer and dryer while they got the job done weren’t the most efficient. They were only 5 years old but were a base model and certainly did not have all the bells and whistles that are available today. It’s really quite amazing how far technology has come in those 5 years and I’ve become quite spoiled with the features and reliability my Maytag Bravos XL offer. 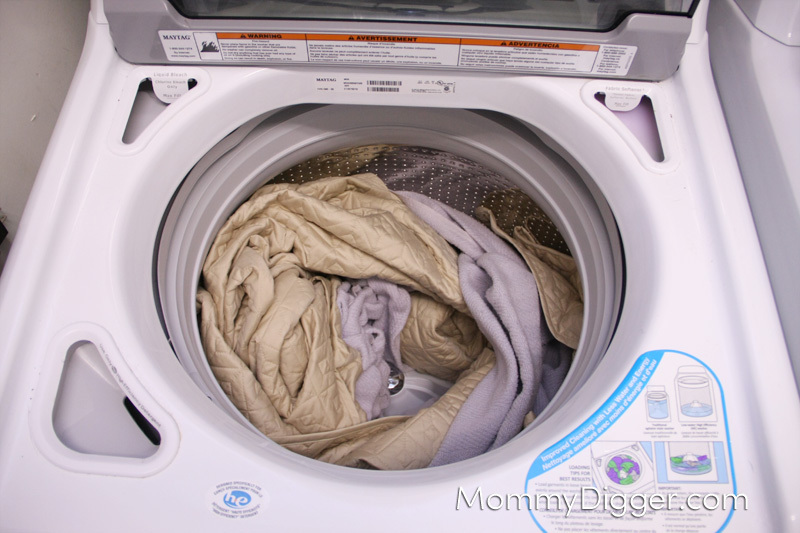 I’ve never been a big fan of doing laundry but since our Maytag Bravos XL have taken a lot of the guesswork out of doing laundry and it’s not as big of a chore to me anymore. I just love knowing that when I put a set of sheets on and set the washer to sheets, it knows exactly how to wash them, what temperature and how much water it needs to get them clean while still being efficient. The Allergen cycle is perfect for my family, Daddy Digger has bad asthma and I have allergies and it gets all those things that can trigger an attack out of our laundry. I also really love the Deep Cold Wash setting because it gets our clothes just as clean as a warm wash does and saves us money. They are so much more quiet then our old set, especially the washer, you’d hardly know there was a load being washed! Another feature that I love is the SmoothClose, Wide Opening lid on the washer, it allows you to get laundry in and out without snagging and closes smoothly which means Pinky won’t get her fingers smashed on accident, which is perfect because now she can actually reach the top of the washer! Our old washer would slam down on accident all the time and I’m very glad it’s now one less thing to have to worry about her getting hurt on. Yep, that’s a KING sized comforter AND blanket in the washer! The Maytag Bravos XL HE laundry pairs are available in both top and front-load options with lots of different features at different price points so no matter what your budget there is a set to fit it. We’re so happy with ours and I would highly recommend checking them out! Sounds like this set has some really amazing features. If I had to do it all over again I would have gotten a top loader instead of a front loader. Live and learn! Nice pair! We have Maytags and happy for the most part. Not the same model as yours. I do like the see through glass! Especially on the washer. Features are really quite amazing! I’ve been looking into getting a top-loader HD. They seem to have the best of best of both worlds between a traditional top-loader and a HD front-loader. I’ll have to check these out when we decide to go shopping for one! Thanks for your input and thought on the Maytag washer and dryer. I been looking around and checking alot of them out lately. I hope that I can get a set of them real soon. I doubt Santa will bring them to me this year – gosh darn LOL. I really like these as you can see whats going on inside each of them.